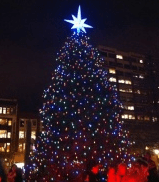 Copley Square Tree Lighting Tonight! Head to Copley Square tonight, November 26th, 2012 for the Annual Copley Square Tree Lighting frm 5-6 PM! There will be light refreshments, live music, entertainment, a special visit from the North Pole, and more. You can find out more information about this free and fun event here.